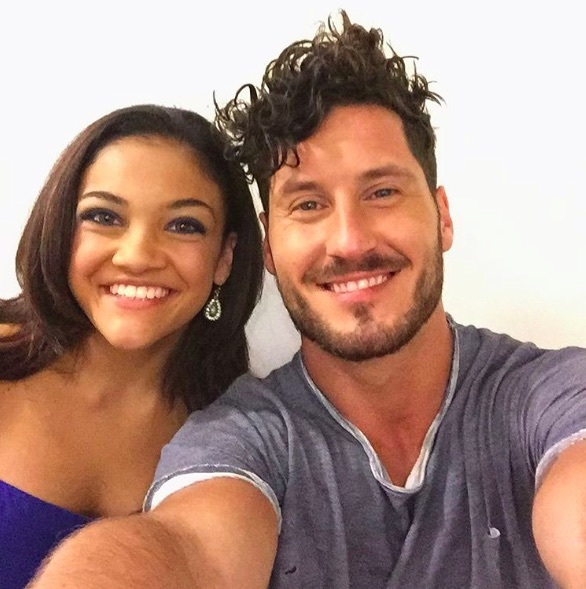 Ever since Olympic medalist Laurie Hernandez (aka the sassiest member of the Final Five) debuted on Dancing with the Stars, we’ve been rooting for her like crazy. And Entertainment Tonight just let us know that she nailed her performance last night! There are no words to describe how epic it was, because Cirque du Soleil week is in full swing. Hernandez and her partner Val Chmerkovskiy performed a jazz routine to “The Way You Make Me Feel” by none other than the King of Pop: Michael Jackson. Dressed in a hot pink dress, Hernandez showed off her killer moves on the floor and maintained that radiating smile that we’ve grown to love her for. Let’s just say that all that pressure of such a grueling rehearsal schedule has paid off – because they received a perfect score of three ’10’ cards from the judges. WOW. "You are the Queen of the ballroom!" We couldn’t be happier for Laurie, because her positivity and gratitude is simply infectious. Sometimes it’s hard to believe she’s still only 16 years old! Oh, and her partner Val is pretty special too. He’s not 16, but he’s pretty great. If you’re feeling inspired to go forth and conquer, that’s the appropriate reaction! Anything is possible if you put in the hard work, stay motivated, and keep a good attitude.